“650 000 acres of paradise” read the signs coming into Black River-Matheson. 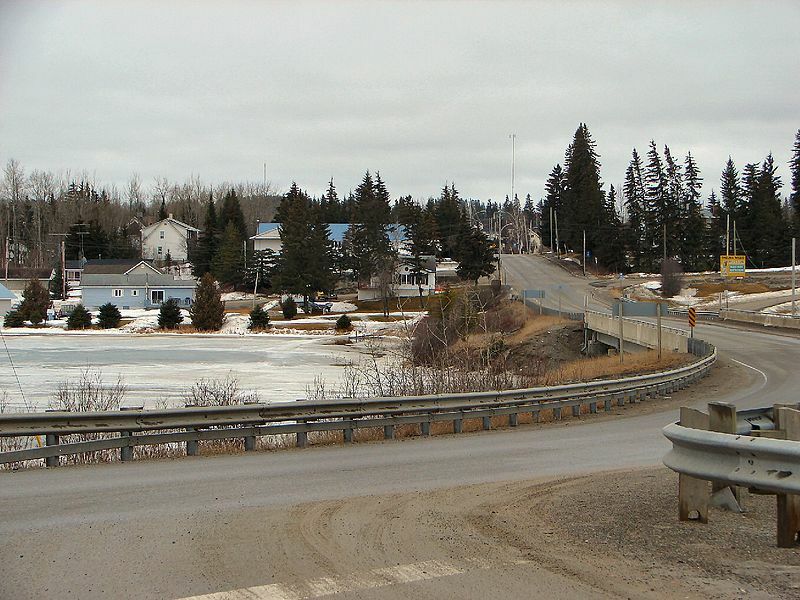 The towns in Black River-Matheson (Monteith, Val Gagne, Ramore, Holtyre, and Matheson) are quaint, clean, and definitely rural – marking the transition between Ontario’s true north and the farms of the Temiskaming claybelt. Matheson serves as a crossroads between road 101 (which runs from Québec to Timmins) and Highway 11. When first founded the town was named MacDougall’s Chute – ‘MacDougall’ being the name of a local First Nations trapper and ‘Chute’ pointing to its mining origins. The government renamed it Matheson in 1906 as they built the railway through the region to transport timber, ore, and wheat back to southern Ontario. Today, a hunk of gold ore sits at Queen’s Park in Toronto as a testament to the riches formerly found in the Matheson area. High upon a hill overlooking Highway 11, the Thelma Miles Museum brings visitors back through Matheson’s history from 1900 onwards. Matheson was the site of the famous Croesus mine discovery of 1914. The largest concentration of pure gold ever to be found was discovered – a pure gold nugget measuring 2” x 1.25” was removed (a model of it is at the museum in Matheson). Gold was so rich that it was mined at an unbelievable 5,945 ounces per ton. The vein was lost about 2 years later – the time of the Great Fire. Matheson used to be the agricultural centre of the northern half of notheastern Ontario. Up until 1995, it even had a Ministry of Agriculture office. One had to go back a few decades to understand why agriculture flourished here. Besides Government incentives in the earlier part of the 1900’s for ‘pioneers’ to settle, and fairly fertile land that far north, was another reason – forestry. Dwight emailed to tell me that, up until the early 60’s, before mechanization came to the forestry industry in full force, trees were harvested using hundreds of horses – and these horses had to be fed. To this day forestry plays a large part in the area. The big plant in Iroquois Falls was in the area, but so were plants in Kenogami Lake, and even several small saw mills in the area. One existed for years (and may to this day) in Ramore. Therefore, there was a bit more to the agricultural industry then meets the eye in the area. Saying that, once the 1960s ended and mechanization of forestry took hold, agriculture began a 25 year decline to near extinction in the area. Two big ‘hits occurred – the 1980-82 recession (that even wiped out nearly all farm manufacturers as they were known then, and only left one intact – John Deere). The final ‘hit’ was the recession of the early 90’s. Before the recession of the early 80’s, there were several larger beef cattle herds, that totaled approx 1000 animals or more, from as far north as Iroquois Falls, south to Ramore. Matheson even had a feedlot and abattoir, with Holtyre having an abattoir. Monteith had a veterinarian for large and small animals up until the mid-80’s. By the mid 90’s there were probably no more than 200 animals, with even fewer today. Matheson is the epicentre of the Matheson Fire. Also known as the Great Fire of 1916, the fire was the largest forest fire at the time and still stands today as Ontario’s most deadly, killing more than 220 people and burning more than 500 000 acres. The fire formed a whopping 64-kilometre front from Porquis Junction through to Ramore – completely destroying all the communities in its path. (The fire is the main reason that ‘Driftwood City’ was rebuilt as Monteith.) It’s been told that those who didn’t escape by train found safety hovering in lakes and rivers. The Matheson Fire led to creation of Ontario’s fire protections branch of the Ministry of Natural Resources. The town’s Rotary Park displays a replica of an old mining cart (pictured) as well as a hunk of ore and a large wooden carving in honour of Aboriginal traders that once made their home in the area. Upon further inspection, the old mining cart has been used as a wastebin for the old election signs of a handily-defeated Liberal politician. There’s also a boat launch and pavilion on the Black River. What I didn’t know is that there was a mine near Matheson that used to be a large producer of asbestos. Apparently, the area has a number of asbestos mines that operated until the 1960s. Johns Mansville had a huge operation on the back highway to Quebec, about 15 km east of town. It closed in the 60’s when the demand for asbestos dropped once health issues became known. There are still large deposites of asbestos in the area (along with gold of course). The Hedman asbestos mine was still operating until recently as far as I know, making safer products they have patented: “Hedmanite” and “Lizardite”. There are still asbestos tailings sites in the area, one site being as high as the mountain at the old Ramore Air Base. I used to be sort of related to someone from Matheson (long story! ), so I’ve been ‘regaled’ with tales of the region’s former agricultural prowess, the size of the markets, the vibrancy of the community, and the bars. Today, with most of the farms are abandoned, the town is a shell of its old self – note the old Stanley Hotel with its Da-Lor Lounge, both of which now sit empty and for sale – a relic of better days. Matheson is the last stop on road 101 to Quebec, about an hour away, and is also about an hour and fifteen minutes from Timmins. Thanks to Dwight for the info on Matheson. For an archive of the 40 comments that were posted to Highway11.ca’s profile of Matheson between 2008 and 2012, please click here. This entry was posted in Temiskaming and tagged forestry, great fires, mining by Highway11.ca Editor. Bookmark the permalink. Looking for a map of the farms from Matheson area from back in the late 1940′s early 1950′s. My grandparents owned a farm, and we would like to find the location that was their homestead. Any ideas on how to find that please? Steve & Ida Sedlacek was their names. Nice to read a little bit about my hometown: I was born and raised in Matheson. Noticed your question about Thelma Miles: she set up the museum and worked tirelessly to collect relevant artifacts, to catalogue and display them. While in high school (in Iroquois Falls), my sister was funded through a student-works project and spent a summer helping Thelma set up displays in the original old house that was the Matheson museum. I have not heard the name Darren Graham for many years. How are you? Still 2 1/2 feet of snow on the ground. Hope all is well. WOW I kind of stumbled onto this blog looking for more geological info on Kamaskotia Mtn… and began to read about all different places I knew of when I was growing up… and lo & behold my Brother-In-Law John Draves from Matheson, ON actually knows you…. so of course I had to let you know that the world isn’t as big as we think it is. Love the articles, thanks for reminding me of all the cool places up in Northern Ontario!